Johnson joined her former coach, Lee Adams, as an assistant at Garfield. Adams replaced legend Joyce Walker, who led the Bulldogs to the 2005 Class 3A state championship. 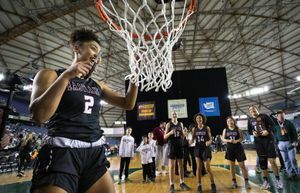 There’s a noticeable difference to seeing Erika Johnson back on the sideline at a girls basketball game – she has to be repeatedly told to stay seated. 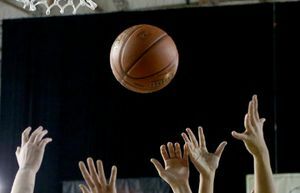 Those are the Washington Interscholastic Activities Association (WIAA) rules for assistant coaches and Johnson joined the ranks this season for the Garfield girls basketball team. It’s Johnson’s first year coaching. She made her mark in the sport by leading Holy Names Academy to the 2011 Class 3A state championship. She finished with 13 points and 10 assists in the title game. She was also the The Seattle Times’ girls Player of the Year that season. Johnson began her college basketball career at Cal, but transferred to the University of North Carolina mid-season as a freshman. Injuries hampered the career of the 6-foot-1 guard. She did appear in all 32 games last year, starting twice. Garfield is being revamped by Lee Adams, who coached Johnson to the title at Holy Names. He replaced legendary coach/player Joyce Walker, who led the Bulldogs to its 2005 state championship. 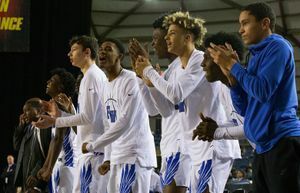 GHS defeated rival Rainier Beach, 62-59, at home on Friday. Senior guard Juanita Agosto led with 19 points. The win improved the Bulldogs to 10-3 overall, 7-3 in Metro League competition. Adams hasn’t coached since 2013, but has a career 200-88 record. He currently works as an intervention specialist at Franklin. “I knew I missed coaching but I didn’t know how much until I started,” said Adams, who is also joined on the sideline by former HNA point guard Laura Sullivan (Gonzaga). Garfield hosts Holy Names on Jan. 25.